This week I’m sharing some Minnesota inspired recipes since this coming weekend the Super Bowl will be taking place here in my home state Minnesota! 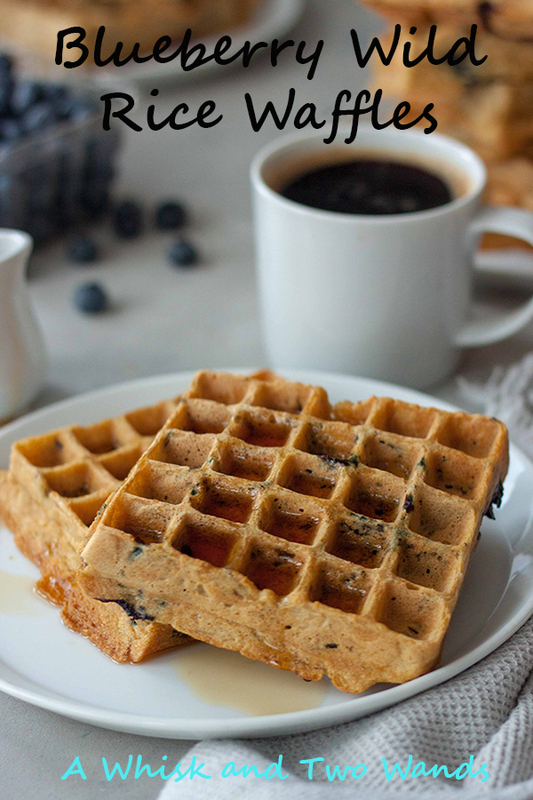 Today hearty and delicious Blueberry Wild Rice Waffles! There are a few places in Minnesota that serve wild rice pancakes but since we like our pancakes light and fluffy I went with waffles. Perfect for a relaxing weekend morning with a cup of coffee while watching it snow, fueling up before or after a hike, or sitting outside listening to the birds. If I could have a nice quiet weekend morning with waffles or pancakes every weekend I would be one happy lady, yep the simple things. Not that I’m not happy but sometimes I miss having a lazy morning as we don’t get them very often anymore. Made with Minnesota grown wild rice and fresh ripe blueberries to say these waffles were a hit would be an understatement. I tested them and my family devoured them, in the middle of the day one weekend so nobody was even hungry for dinner. I made more and planned to see how they did in the freezer for weekday toaster waffles but there weren’t any to put in the freezer. The only downfall about these waffles is that you can’t wake up and just make them, well you can but you have to make the wild rice first. I usually make rice ahead of time and make double so I can make soup, salad, or freeze some for later for more waffles when I do wake up wanting them I just have to defrost the rice. I had plans of topping these waffles with a cinnamon (dairy free) whipped cream but ended up going with pure maple syrup. It’s one of those simply perfect combos that brings you back to simple homemade comfort food that feeds the mind, body, and soul. Plus there is just something about filling each and every little square with a little maple syrup just like I remember doing as a kid and what made waffles so different then pancakes. Of course you can top them with whatever you like. I have a feeling there will be a couple people reading this that will even think to top them with an over easy egg. These are waffles anyone can enjoy and there are vegan and gluten free options. If you do eggs make them with eggs, if you don’t use flax eggs. They are dairy free, and the flour there are a few options gluten free all purpose, all purpose, or a combination of all purpose and whole wheat whatever works for you. If you have a favorite waffle mix or recipe you can easily adapt it to make these waffles. If using a mix I would suggest adding 1 cup of wild rice to 2 cups of mix. 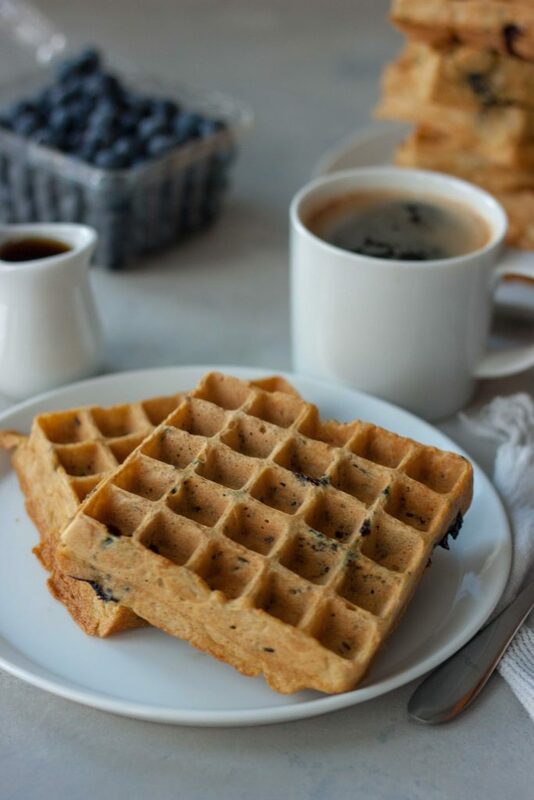 While I made these with the intent of being a weekend breakfast, or for mornings when you have more time, you can easily turn last nights leftover wild rice into waffles with your favorite waffle mix. I think we might just do that today because Waffle Wednesday and I’m going to need some serious fuel to get through this week. Maybe this time even having some extras to try to freeze and warm in the toaster. If I do I will update with results. While usually this isn’t an issue I’m pretty sure we’ve all had waffles that aren’t the same toasted or get soggy when reheated in the microwave. I don’t know about you but I don’t like soggy waffles. 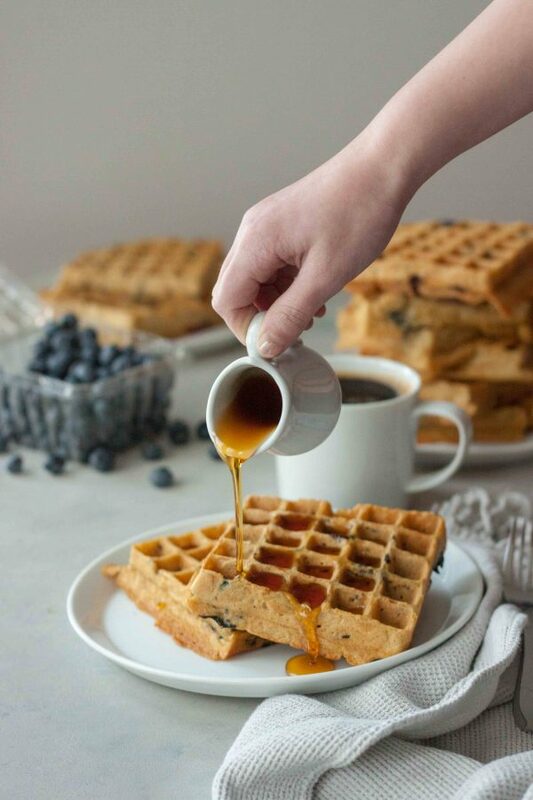 Put these Blueberry Wild Rice Waffles on your list to make this weekend and enjoy a taste of Minnesota and relax, take in the morning and just enjoying it! 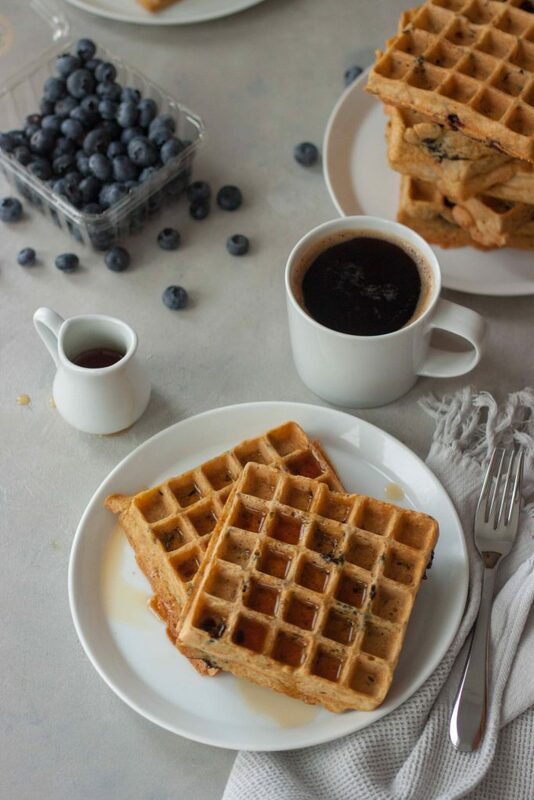 Hearty Blueberry Wild Rice Waffles are a taste of Minnesota perfect with a cup of coffee on a relaxing weekend morning. Gluten free and vegan friendly. In a liquid measuring cup add lemon juice and then just enough of the non dairy milk to reach 2 cups. Mix, let sit for 5 minutes. If wanting to make these vegan, egg-free, also make your flax eggs now. In a large bowl mix together milk mixture, eggs, and coconut oil. In another bowl mix together flour, baking soda, baking powder, and salt. Add dry ingredients to wet ingredients and mix until just combine. Spray preheated waffle iron with coconut oil or non-stick cooking spray. 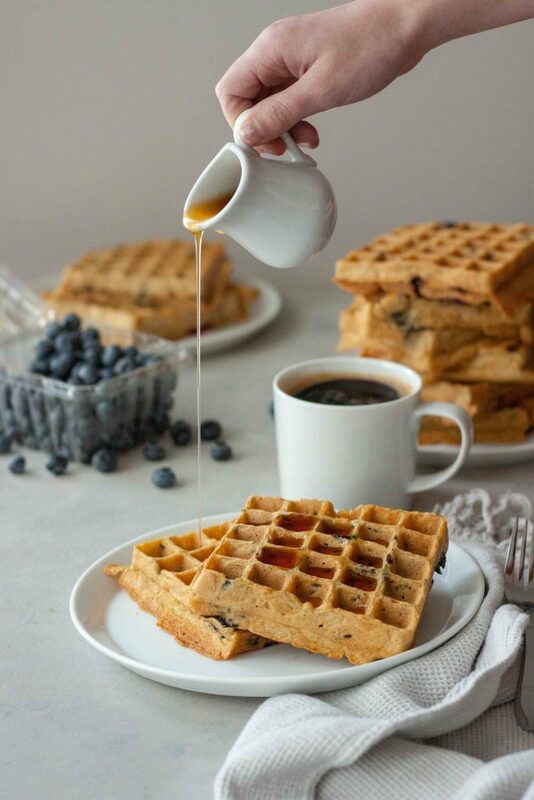 Pour batter into your waffle iron and sprinkle with blueberries. Cook until golden brown. Serve hot with pure maple syrup. This is such an awesome idea! 😀 I need to go get some wild rice! 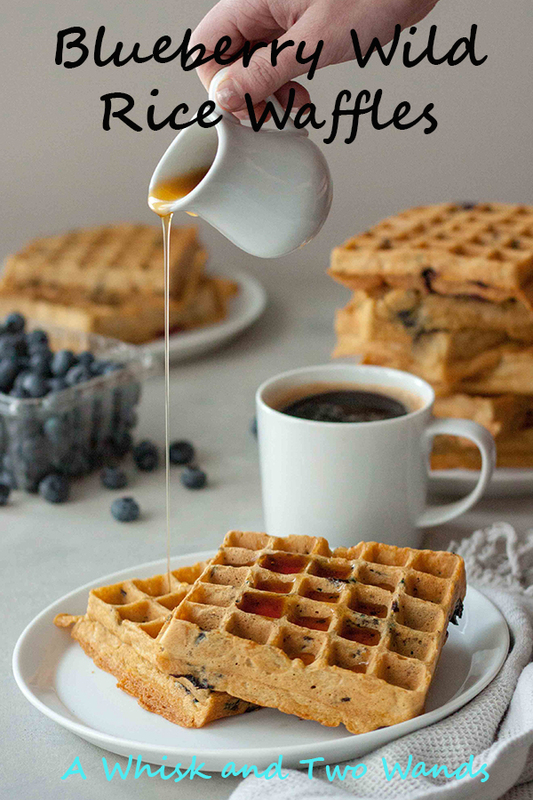 So much love for waffles (+ blueberries)!! I’ve been looking for a good, vegan+gluten free waffle recipe and tried this today. This one is a keeper! I didn’t have rice, so I used quinoa instead. Also, I doubled the recipe so we would have leftovers for a quick breakfast before school and found I needed to add 1 extra cup of the milk mixture (I used almond milk). My whole family loved them!! Next time I’ll quadruple the recipe! Thank you! These were delicious!!! I used brown rice since I didn’t have wild rice. It worked beautifully thank you for sharing this. Thank you! Good to know they work well with brown rice and I bet they were nice and hearty. Hope you have a great week and thank you for sharing.